We were aware the spend hours for a single acquisition or advertising report sort of a waste time, instead you might use that time for different purposes. That’s why now you can create any kind of advertising report based on your needs. Therefore you are able to create your own dashboards based on your KPI’s as well. 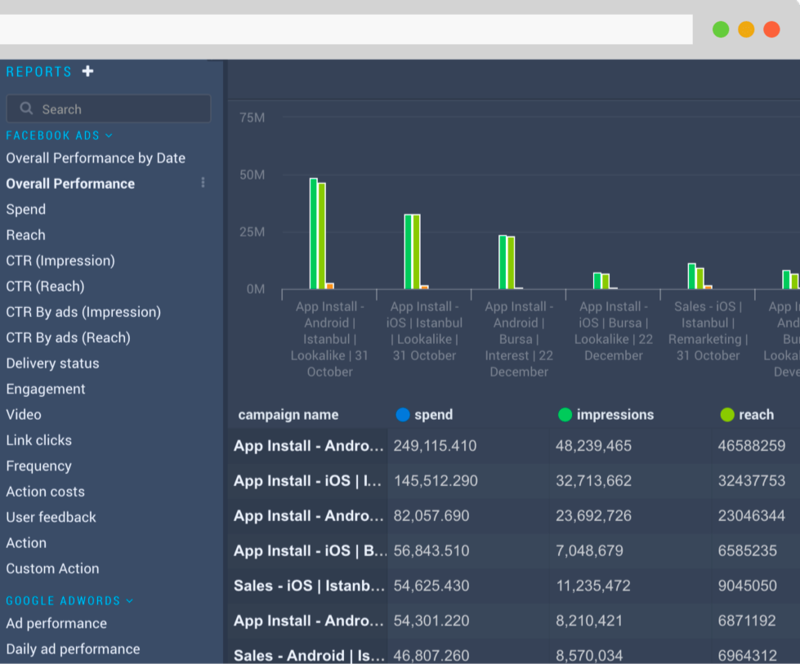 Monitor performance of campaigns in a single dashboard, and any data can be layered with other sources like Stripe, Intercom and Google Analytics for a deeper understanding of campaign outcomes. The automatic availability of AdWords and Facebook Ads data in one place (Rakam gets the data from Facebook Insights and Adwords Reports APIs daily) makes it possible to monitor how both sources are performing on a single dashboard, comparing apples-to-apples metrics. Besides there’s always a chance to create different reports for C-Level / Based on your KPI or definitely your needs. You can also generate more detailed views such as ROI from ad campaigns broken down by conversion actions or funnel stages also both real-time and historical data-sets, join them with your different data-sets and create custom reports and dashboards as well. At a more advanced level, combining Facebook and Google campaign data with other customer data that can be pulled into Rakam, marketers or advertisers can get a more complete picture of the types of actions users coming from Facebook and Google ads take — such as completing a transaction, renewing a subscription, taking in-app actions, submitting support requests, writing reviews, etc. — and match those actions back to campaign goals to understand if a campaign is achieving the intended outcome. Advertisers or marketers can build attribution models in SQL rather than having to rely solely on conversion events set up in Google and Facebook, to get more granular views of customer behaviour as well as to help avoid double-attributing conversions to each source. By pulling in customer data from other sources also can get a more complete picture of the types of customers or leads campaigns are attracting and how that is impacting other functions of the company. Bonus You can combine your Google Webmaster Tools, Intercom, Mailgun, Pipedrive, Mixpanel or Custom Integration data with Facebook Ads and Google AdWords to find out.